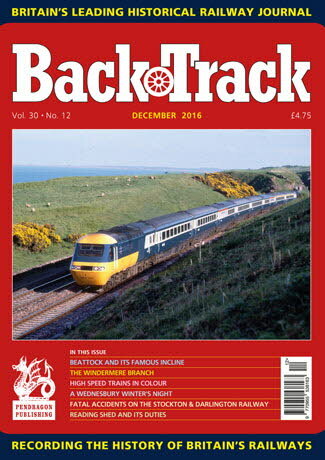 Railway Magazine | BackTrack December 2016 journal from Pendragon Publishing. A Steady Climb - A. J. Mullay explains the background to Beattock and its famous incline. The Early Years of 'The Gem of Railways' - Jeffrey Wells looks at how the railway reached Lake Windermere. A Wednesbury Winter's Night; Part One - David J. Hayes describes a night shift at Wednesbury No.1 signal box 40 years ago. Snaigow and Durn - David P. Williams portrays two Highland Railway locomotives. A Derbyshire Outing - archive photos taken by Alan Tyson on the Buxton to Ashbourne line. High Speed Trains: still available in a range of colours - six pages of colour by Keith Dungate celebrates 40 years of the Inter-City 125s. The Train Ferries: Part Two - R.A.S. Hennessey concludes his survey of a very special form of rail/ship transport. Across the Midlands - a colour spread covering locations from Grantham to Nuneaton. The Departure List - George Smith looks at fatal accidents on the Stockton & Darlington Railway between 1825 and 1845. Further Recollections of Reading Shed and its many duties - as told to Paul Joyce by former fireman Richard Smith.